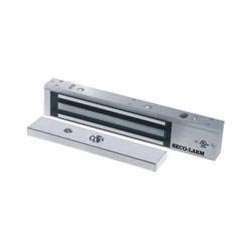 The Seco-Larm E-941SA-600 is a MagLock used for securing a door against unlawful entry. When power is run to the electromagnetic lock, it creates a strong magnetic field. Once the electromagnet is deactivated, the secured door will function normally without any residual magnetism. The electromagnet is attracted to the steel armature plate which is mounted directly to the secured door. The E-941SA-600 is housed in anodized aluminum and has a detachable face plate. Full monitoring is standard and it is recommended for traffic control, interior doors, and airlocks. The quick mount assembly reduces installation time compared to epoxy sealed magnetic locks.